Soccer is a universal game, which has seen much popularity in Australia. It is an international sport played by people of all ages and gender. Children from the ages of 5 years old to 10 years and beyond old enjoy the game of soccer. If you play soccer for pleasure or in a competition, soccer training balls are an excellent tool to improve the central skills necessary to perfect your soccer game. This includes throwing the ball, kicking the ball and dribbling the ball. The sport of soccer is a game where precision is necessary. For that reason, it is recommended that you practice your soccer game as much as you possibly can. It will improve your accuracy and perfect your soccer skills. If you are looking for soccer balls that are suitable for your children to practice, the Pass Master Soccer Training Ball is your best option. This is an excellent Christmas gift for your child. When the child opens up their packaged gift on Christmas day, there will squeals of delight with their finding. The Pass Master Soccer Training Ball is a gift that children will love, especially those who play the game of soccer. The ball will help your child to improve their confidence as well as their hand-eye coordination and sensory coordination. This is the ideal gift to give a child who doesn’t like to kick a soccer ball and have to fetch it because it went over the fence or out on the streets. 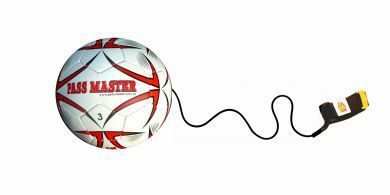 The Pass Master Soccer Training Ball is a soccer ball on a string and for that reason; you won’t lose the ball as it is being kicked. For those prospective goalies, the Pass Master Soccer Training Ball is one of the best soccer training balls that will improve a goalie’s skills. With the Pass Master Soccer Training Ball, you will improve your heading, throwing, catching and kicking skills. You can practice from anywhere, whether at home or while visiting the community park. You will be able to bring your Pass Master Soccer Training Ball with you. Christmas is just a few days away. Therefore, it is time to select the best gift for your son or daughter who loves to play soccer. You no longer have to sit and think about what to buy your kids. The Pass Master Soccer Training Ball is something that any child will love, especially because of its unique features – a ball on a string. No other kid on the block will have one like this. This will encourage your kids to play soccer more often. Order your Pass Master Soccer Training Ball today! What’s Taking place i’m new to this, I stumbled upon this I have found It positively helpful and it has helped me out loads. Hi, thanks for the email. I wondering what exactly the soccer king club is, and what country are you from? If you ever need any soccer training footballs please let me know.